The last few years have seen a flurry of new cruise terminal construction including the Crown of Miami terminal in Miami and the Cape Liberty terminal in New York harbor. A major driving factor behind this construction is that the cruise lines are building larger, more technologically advanced ships, which require more advanced terminals. 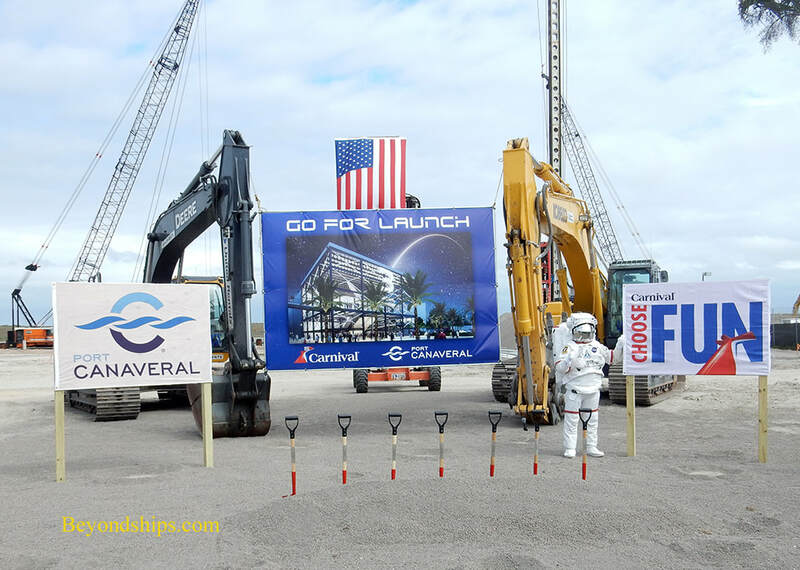 On May 18, 2019, Port Canaveral and Carnival Cruise Line hosted the official groundbreaking ceremony for the port's new Cruise Terminal 3 also known as the “Launch Pad”. The new terminal is being built as the home for Carnival's 180,000 gross ton Mardi Gras, now under construction in Finland. 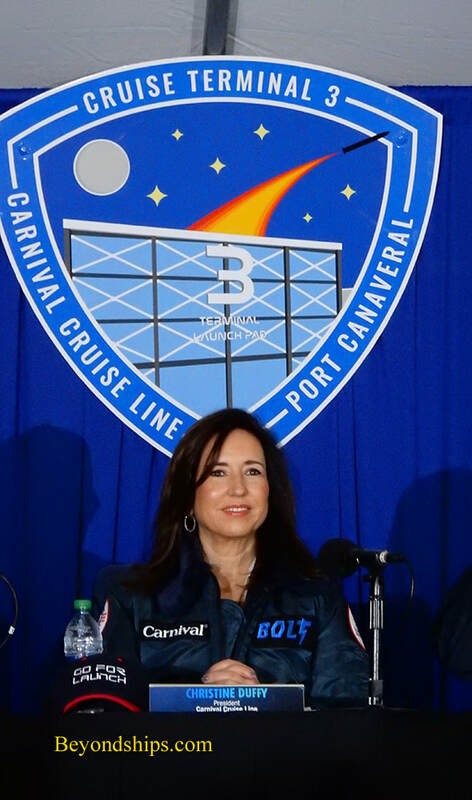 At the ceremony, Christine Duffy, President of Carnival Cruise Line, reflected on the relationship between Port Canaveral and Carnival. “The relationship between Carnival Cruise Line and Port Canaveral actually goes back three decades. The arrival of Mardi Gras in 2020 will mark the 30th anniversary of our operations from the Space Coast with another groundbreaking ship that we had at that time named Mardi Gras. We are the port's number one cruise operator starting with that ship back in 1990, carrying 100,000 passengers. Fast forward 30 years, we now have three ships based here in Port Canaveral, carrying over 650,000 guests per year. Next year, ahead of Mardi Gras, we will be homeporting our transformed Carnival Radiance [currently Carnival Victory] after a $200,000 refurbishment. “Port Canaveral gives us such great accessibility with people coming from all over the southeast. A great and friendly community here and that is why we believe that this is such a great spot to deliver Mardi Gras. Captain John Murray, Port Director & CEO of the Canaveral Port Authority pointed out that this is the single largest construction project in the history of the port. The new terminal will be two stories encompassing some 185,000 square feet. There will also be an adjacent multi-story car park capable of handling 1,800 vehicles. The original cost estimate for the project including improvements to the surrounding roads is $150 million. The new Cruise Terminal 3 will be built on the site of the port's original cruise terminal 3. Project Manager Scott Bakas of Bermello, Ajamil & Partners, Inc. noted that this site was where Premier Cruises' Big Red Boat sailed from in the 1990s, which marked the beginning of Port Canaveral as a modern cruise port. 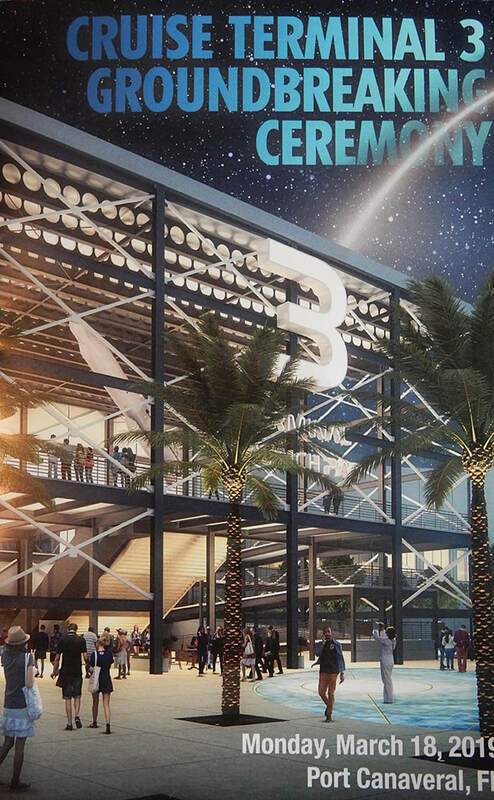 Although this event was the official groundbreaking for Cruise Terminal 3, work on the project had already begun. The old cruise terminal had already been demolished and the old pier had been removed. Cruise Terminal 3 is scheduled to be ready for Mardi Gras' arrival in 2020. Above: Christine Duffy, President, Carnival Cruise Line. ​Below: The future site of Cruise Terminal 3. ​Above: The ceremonial first shovel.